Collins Booksellers - CLEP College Mathematics 2017 by Kathleen Morrison & Sharon A Wynne, 9781607875499. Buy this book online. For those parents and students who thought college was unaffordable there is a remedy, yes even free college courses! Not only will passing a CLEP exam get you out of a course you will also get the college credits on your transcripts. Even more astounding the tests only require a 50% score. This is your ticket to the fast lane out of the basic college math course. You probably don’t want a math or science career and typically want to fulfill requirements. Self study has become more popular with so many internet opportunities. XAMonline full study guides will give you 100% confidence. The books are available in a digital or print format. CLEP college math has been around for twenty years and is the most popular credit by examination program. 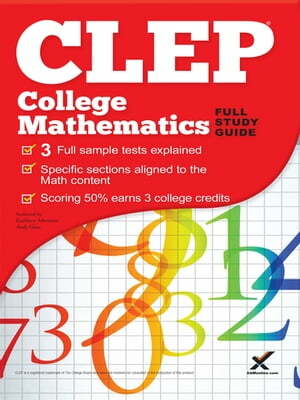 The CLEP college math program has 33 unique tests but among those CLEP Algebra is the number one most frequently taken math test. You should already have taken high school Algebra in high school. Your training should have included algebra, operations, equations and inequalities, functions and their properties, and number systems and operations. The test feels equally weighted favoring functions and their properties. XAMonline provides the perfect fit of content which covers the unique chapters only found in this special guide and provides the true to test experience with multiple sample exams. Sample test experience Time management is one goal of test prep. Get acquainted with the directions and the format of the CLEP college math test. The XAMonline sample test experience will expose you to each question type, and cover the range of topics which are distributed and weighted just like the test. XAMonline sample tests are simple to use and understand so that you just don’t test yourself, you have a place to find the answers back inside the content. Tell your friends and family Those high school students who may be your family and friends can take the CLEP too. You are never too old or too young to take a CLEP.